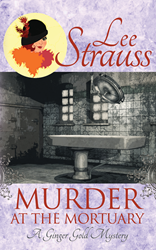 Murder at the Mortuary, Book 5 in The Ginger Gold Mysteries Series by Lee Strauss, is available nationwide beginning today, April 17, 2018. Books one through four released March 20, and book six will follow in June. Strauss’ venture into the cozy historical mystery genre delivers a charming array of murders, suspects, and potential suitors. Strauss transports readers to an almost magical decade bookmarked between two major wars. Post-WWI was a time of letting go of pre-war social restraints, and for the youth it was a time to seize the day. The war made everyone aware of how short life could be. By living large and embracing the outrageous, this generation of youth meant to forget the horrors of when the bombs fell. The Ginger Gold Mysteries series paints a beautiful yet thought-provoking image of the Roaring Twenties, with its lavish descriptions of the fashion along with discussions of the social norms of the time. During the 1920s there was more money and more social freedom, especially for women, than ever before. It was the age of revolution, from electronics to social constructs. Main characters Ginger Gold and Haley Higgins push these boundaries, as their feisty spirits and sense of adventure help them to rise above some of the limitations bestowed upon women of their time. By combining history and fashion, Strauss creates a fun and lively series that entertains both historians and fashionistas alike. For more information about the Ginger Gold Mysteries Series, please visit http://www.leestraussbooks.com. Founded in 1994 as an Entrepreneurial Publisher for Entrepreneurial Authors®, Brown Books Publishing Group was established to fill a need in the publishing world by allowing authors to have a voice in the publishing process while retaining the rights to their intellectual property. Applying this innovative Relationship Publishing™ model, Brown Books has cultivated a prestigious stable of authors, from New York Times bestsellers to Pulitzer Prize winners and more. Boasting hundreds of high-quality books across genres, Brown Books is a fiercely independent publisher that encourages author empowerment. In 1994, Brown Books ushered in A New Era in Publishing™, and more than two decades later, continues to be a successful innovative leader in the publishing industry. For more information, please visit http://www.BrownBooks.com. As a sister company of Brown Books Publishing Group, The Agency at Brown Books is backed by more than 20 years of publishing excellence, leveraged in the first full-service public relations, marketing, branding and distribution provider within a publishing house. The Agency provides high-level public relations, marketing and distribution services for not only Brown Books authors, but also non-affiliated authors, all within the same house. For more information, please visit http://www.TheAgencyatBB.com.